Oh, wait. You can’t remember the last time you said something like that? Sweet, we can stay friends! Because I can’t remember the last time I said that either. In fact........I’ve never said that. What I can remember saying to another mom is that I am so overwhelmed with four boys and I mostly feel like I have no idea what I’m doing and I often feel like I get it wrong. And even as I type this to you now, my heart is aching for one particular struggle that one of my boys is facing. And I would do anything to fix it and protect him from it. But I can’t. And I don't like that, quite honestly. I want to rescue this boy that I love so ridiculously much from having to go through this. I want to tighten my grip and get control over the situation. But what I know in my heart is that it’s in moments like this that God is inviting me, all over again, to trust His sovereignty over my son’s life and rest in His grace that is enough for both of us. So I pray and I pray some more. And I beg God to help me accept that so many of the things I am trying to control are ultimately dependent on God’s work in my child’s life. And I beg God to help me remember that I have the privilege of being an instrument of grace in that work rather than carrying the responsibility to accomplish that work. And I invite God, all over again, to unclench my fits that are trying to control outcomes and open my hands to accept the good work He will be faithful to accomplish in my son’s life. So sister, what I want you to know is that being a #momsetfree doesn’t remove the pressure we face and it doesn’t magically make motherhood easy. I still have to go back to the Good News every single day. We don’t graduate from needing the Gospel. Ever. Amen? Being a #momsetfree is about DECLARING the Good News over our lives, over and over again, because our enemy is never (ever!) going to give up on trying to put those chains back on us. He is never going to give up on trying to make us feel anything but free. So I have a little something for us that is going to help us grow in freedom! 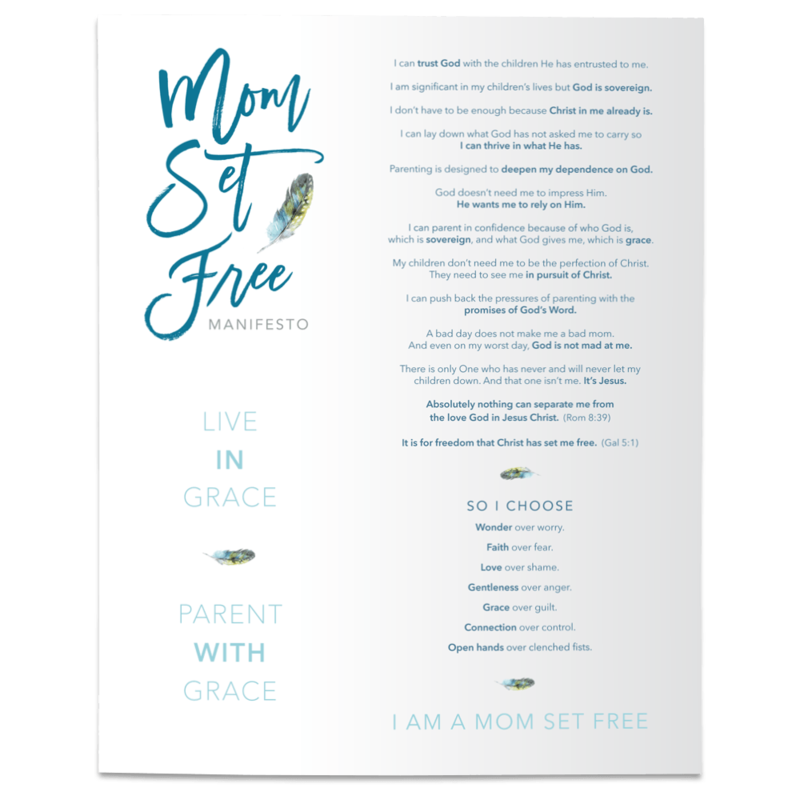 Beginning February 1st – and then every other day throughout the entire month - I am going to post a “freedom declaration” from the Mom Set Free Manifesto on my Instagram and Facebook pages. TOGETHER we will DECLARE the POWERFUL PROMISES of God’s Word over the pressures we face in our parenting. We’re basically telling the pressure that it’s not the boss of us, and we are holding tight to the promises of God, even amidst the pressure. Doesn’t that sound so good? There are 14 declarations in the Mom Set Free Manifesto. If you're a part of my newsletter, I will send some – but not all – of the declarations right to your email address. But because I don't want to bombard your inbox, you’ll need to follow along on Facebook or Instagram where I will post all of them. For a free download of the Mom Set Free Manifesto, scroll to the bottom of this page to sign up for my newsletter! This is also how you can receive my blog posts right to your email inbox. Oh, I cannot wait to do this with you! February is for Freedom so let’s get after it and enjoy all the benefits of being daughters of the KING and the freedom that it brings in our parenting!